"Majestic in its simplicity, and overwhelming in its power." Other Stars: Vincent Scully, Julian Bond, Al Gore, James Watt, J. Carter Brown, Ted Koppel, Rosa Parks, George Wallace Jr. Even a casual visitor to Washington with no particular connection to the Vietnam War is likely to make the pilgrimage to and be touched by the memorial to that war's veterans, the wall bearing the names of the dead. Its power and understatement are decidedly unlike war memorials of the past, or other monuments in our nation's capital—no tower soaring high into the heavens, no oversized paternalistic rendering of Jefferson or Lincoln—and in so many ways, it's exactly the right commemoration of that difficult conflict, a war that may have been politically unwise and self-defeating, but one that was fought with valor and bravery by the women and men in uniform. It's become as much a part of the landscape of Washington as the Supreme Court, or the Watergate, or the statue of the G.I.s raising the Stars and Stripes at Iwo Jima. But it didn't start that way, and when the design by an architectural graduate student at Yale was selected the winner of a competition, in the early 1980s, it set off a firestorm of debate, metaphorically re-opening so many of the wounds of the Vietnam era that had just barely begun to scab over. 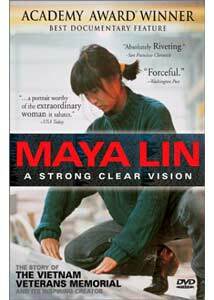 That student was Maya Lin, 21 at the time, and this documentary is a portrait of the woman and ten years or so of her work. The rest of the film doesn't have the same impact as the discussion of the Vietnam Memorial, but it's still a creditable portrait of Lin's early professional career, the second high point of which was probably the civil rights memorial she was commissioned to design, in Montgomery, Alabama. It's hard not to be moved by the images of Rosa Parks touching her own name on Lin's memorial, as water cascades all about—Lin took her inspiration from Martin Luther King Jr.'s "I have a dream" speech, in which he said: "we will not be satisfied until justice rolls down like waters and righteousness like a mighty stream." The monument makes his metaphor concrete. The mothers of civil rights martyrs Emmett Till and Andrew Goodman are on hand for the dedication, as well, and once again, Lin's craft has made manifest the deep feelings and passions of so many Americans. The documentary works well in situating an architect in a professional context—some of Lin's work is about big ideas, about how best to touch the human heart, to get people in touch with their environment; and some of her professional life is about striking up a good rapport with the Teamsters who lug forty-three tons of ground glass around Columbus, Ohio for one of her sculptural installations. The film backtracks a little, and fills in some biographical information on its subject—the child of Chinese émigrés, Lin grew up a college faculty brat in Athens, Ohio—and also shows her working on projects on a smaller scale—a family home in Williamstown, MA, for instance. She sits for interviews, and is forthright and articulate about her work; she's less so in other public settings, though, and is obviously uncomfortable, for example, at the tenth anniversary of the Vietnam Memorial. Her remarks at the ceremony are brief, and when, later, vets are eager to hug her and share their stories, she seems rightly proud of her work, but can't or won't let herself emote in public, with strangers. It must be heady stuff, to have that much success at such a young age, to be the subject of a feature-length documentary when you're still in your early 30s. But Lin remains a paragon of grace throughout, and with the exception of one unfortunate voice-over early on in the movie, the filmmakers do an admirable job of letting the architect and her work speak for themselves. Image Transfer Review: The technical elements of the filmmaking look a little underfunded, and some of the older news footage seems especially weathered, but this transfer to DVD looks more than adequate. The palette is occasionally a little oversaturated, but only a few scratches and bits of debris interfere with the overall picture quality. Audio Transfer Review: Nothing too remarkable here, but the words can all be made out readily enough, even when, at public meetings, some of the speakers are battling the feedback from their very poor microphones. Extras Review: Brief bios are provided for Freida Lee Mock, who produced and directed, and for her producing partner, Terry Sanders; unfortunately, no other information on Lin is included. A Docurama catalog with a generous number of trailers is the only other extra. In this canny bit of documentary filmmaking, Maya Lin and her work are presented with clarity and empathy, two attributes that the architect possesses herself, and seems to seek out in her audience. Recommended.